Topic: Step by step tutorial: making vehicles for the pakset. There is already some detailed information on how to produce graphics/objects for this pakset, I thought that a detailed step by step tutorial might be more digestible to those creating pakset objects for the first time. 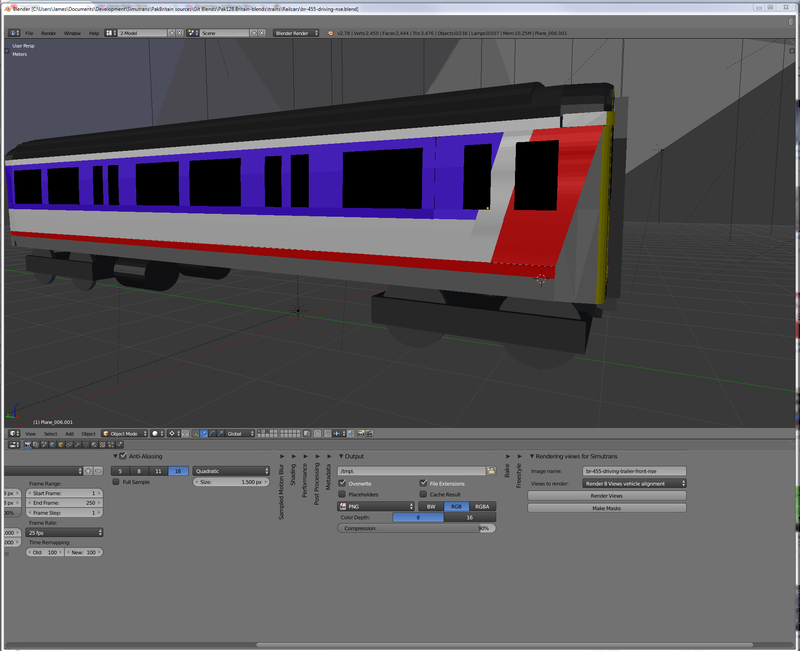 The way that this will work is to go through every step of the process for changing the livery on a single set of rail vehicles (the BR Class 455 EMU, chosen because of the simplicity of the livery change). I will not repeat detailed instructions that can be found elsewhere (such as how to install Blender), but I will post a link to the relevant material here. In outline, the process has a number of components: (1) setting up the file management system (Git); (2) modifying the 3D models; (3) exporting the 3D models; (4) editing the data files (".dat files"); and (5) compiling your new vehicles so that they work in the game. I have posted this in the forum for the Simutrans-Extended version of the pakset, as some of the features described (especially liveries) work only with Extended, but most of these steps will work equally well in producing graphics for Simutrans-Standard. I have assumed that you are using Windows, but many of the steps are agnostic as to which operating system that you use. You will need to install some software, but none of it costs anything to download or use. Important: All content for Pak128.Britain (both the Standard and Extended version) is made available under The Artistic Licence 1.0. You will need to release your content under the same licence if it is in any way based on the existing content or it is to be incorporated into the pakset. This step is not absolutely essential, as you can just download the files of the 3D models to modify directly from here and get the .dat files to modify from here, but if you are planning to do more than a very few, setting this up properly will make a huge difference to how easy that it is in the long term. First, set up Git itself. Follow the tutorial here. You will need to set up two Git repositories: one for the 3D models and one for the .png and .dat files. Although Simutrans has no 3D engine, Pak128.Britain's graphics are all made from 3d models which are rendered and exported as 2D sprites. This gives a much more realistic and consistent look to the graphics then if they were pixel painted by hand, and it is also much easier to make the graphics this way. 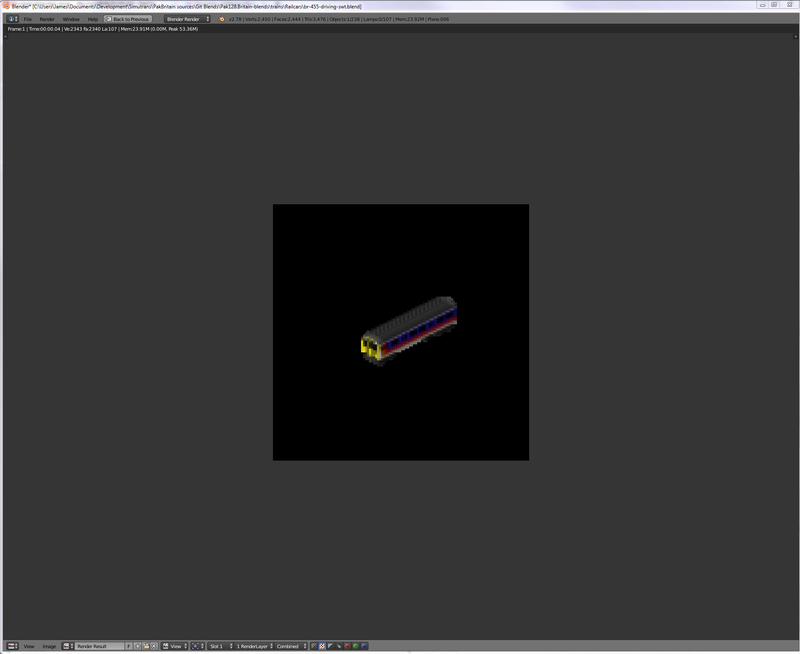 All of the graphics for the pakset are made using a piece of open source 3D modelling software called Blender. Here is a tutorial on how to install Blender for Windows. Some people think that Blender is complex to use, and it might be for very advanced functions, but, because the graphics in Simutrans are very low resolution (up to 128x128 pixels in this pakset), you will only need to use the most basic features of Blender. 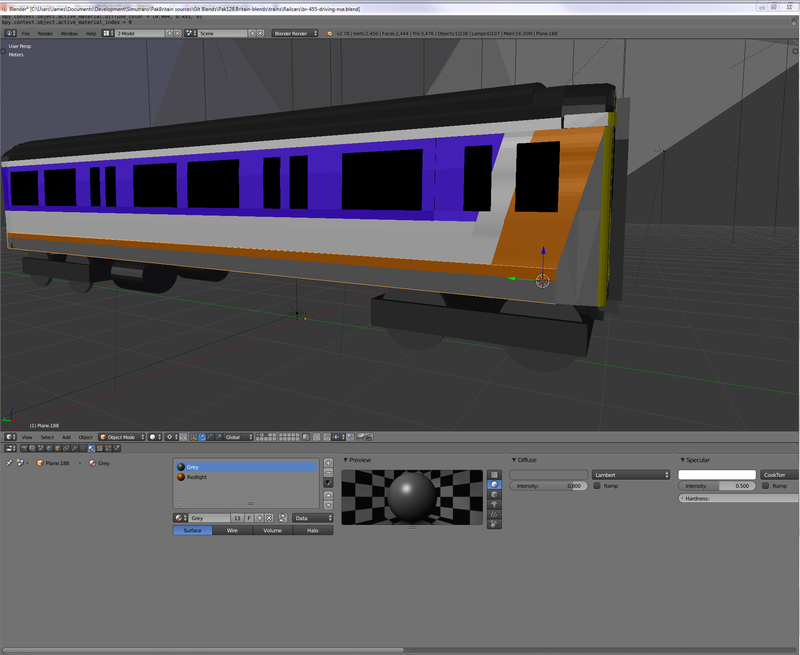 However, it does help to know the basic features of Blender. Here is a good tutorial on how to use Blender. You only need to get part of the way through, as it quickly moves into more advanced features that you will not need. This was the tutorial that I used to learn Blender. If you have followed the instructions in Stage 1, you should have a directory on your computer with all of the 3D model files (with the extension .blend) for the pakset. Most of the vehicles and other objects in the pakset have their 3D models here, although there are unfortunately a number with the 3D models missing for various reasons. (Images courtesy of Wikimedia Commons) The shape of the livery does not need changing, making this an easier amendment. First, save it under a different filename (I recommend br-455-driving-swt.blend to keep everything consistent) so that any changes that you save as you go along do not overwrite the NSE version. Make sure that the wheel is set to "HSV" (click the middle button), as all the values given in the standardised livery post are in HSV. ("HSV" stands for "hue, saturation and value". Hue describes what colour that something is. Saturation describes how strong that the colour is (whether a deep colour or a greyish colour) and value describes how light or dark that the colour is; all the numbers range from 0 to 1 using 3 decimal places). You just need to repeat the process for all the colours. In the above image, the grey has already been selected for you to turn that into white. You will also have to adjust in some cases which colours go where: for example, when you change the white to red, the white stripe at the top will become red, too, which is not what you want, so you need to re-assign those colours to white. and then change it to white (note that I have renamed the colour here; if you have not renamed it, it will still be "grey"). You should also change the colour of the very top band of white on the stripe to blue to make the sides better proportioned. Similarly, you will need to make sure that the end lights are red rather than orange in the same way, as, in the NSE version, they share a colour. 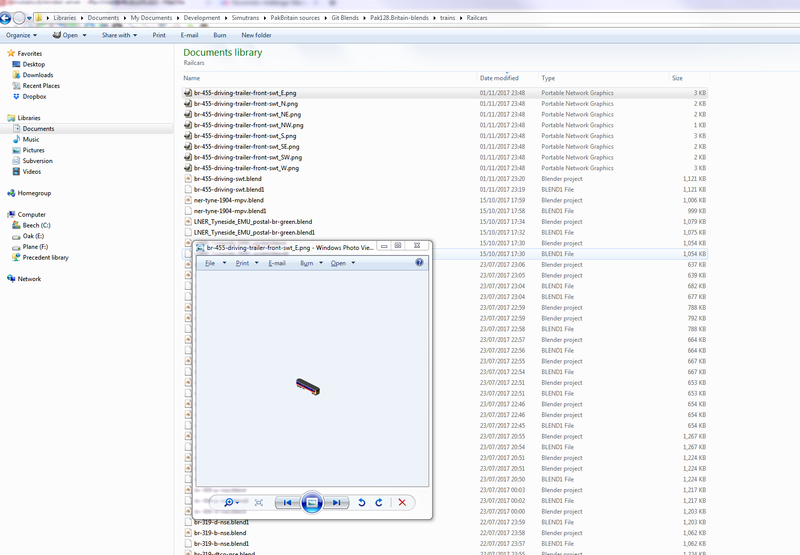 You are now ready to render and export the graphics to .png files for use in Simutrans. This process has now been almost entirely automated, but you will first need to download and install the addon for doing this. The addon can be downloaded here. See here for a tutorial explaining how to install the addon. 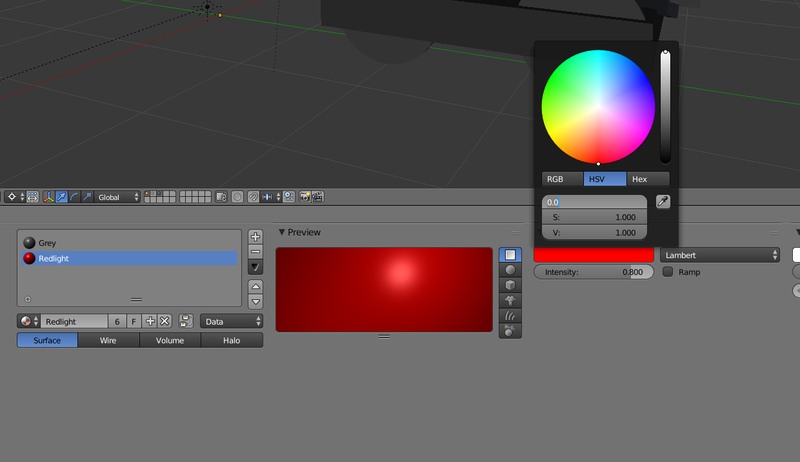 The change from 11 to 16 and from RGB to RGBA make sure that the image is exported to a transparent background. The change of the name makes sure that the images have a unique name. Important: When you are ready to render, always save before rendering, as, if you save after rendering, it will already be rotated and the automatic rendering will not work properly. Press ESC to quit the preview. To render, press "Render Views". 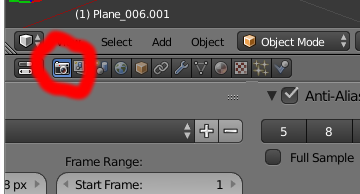 Sometimes, Blender stops responding properly after you have done this: this appears to be a bug in Blender (as of 2.78). To work around this, close Blender and open it again. Remember, do not save after rendering. Edit: If any of the newly rendered vehicles (especially railway carriages) are to be used in the same convoy/train as vehicles produced using the old method (those whose .png files have a sky blue rather than a transparent background), you may need to increase the vehicle's size slightly to make it fit with the other vehicles: see here for details. On your computer, it will be wherever you put the data files. The "trains\images" will always be the same. This works by defining an entire livery scheme ("SWT"), which can be chosen by players, and then individual liveries within that scheme which are automatically applied depending on the current date and availability of that livery in each vehicle. definitions after the existing definitions. 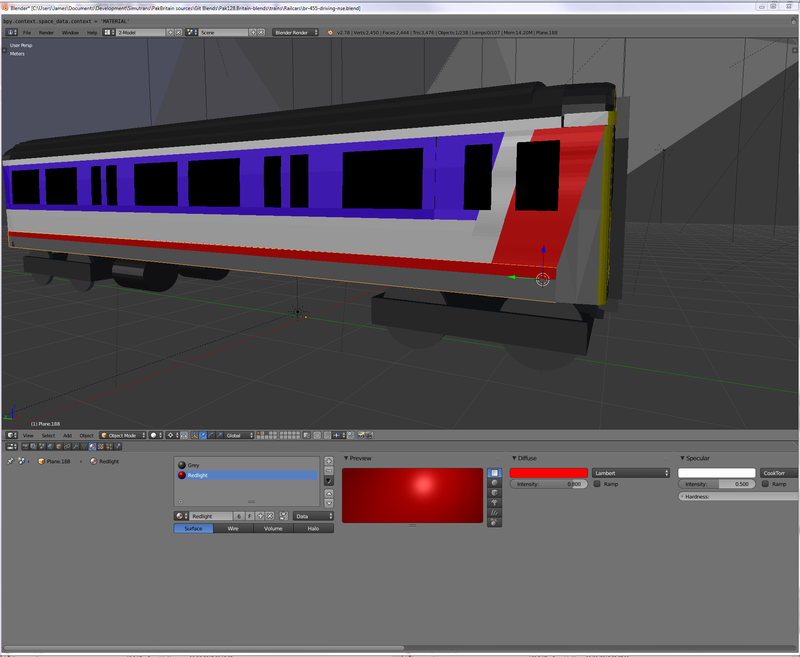 You can then modify all the other vehicles that form this class of unit in the same way (including the steps about modifying and exporting the 3D model above) so as to apply this livery to the whole train. If you have followed Stage 1, this step should be quite easy. First, you need to download the latest version of makeobj. Currently, that can be found here. Save the file and then close it. Then, just double click on makeALL.mos, and the entire pakset, including your newly modified vehicle with the new livery, will automatically compile itself. Just move the resulting pakset directory to wherever you put your Simutrans-Extended pakset directories, and you will be able to test and use your modified vehicles. Once you are happy with them, go back to the Git tutorial in Stage 1 and learn how to create your own Github repository and push your changes to that so that I can easily automatically download your changes and merge them into the pakset. Re: Step by step tutorial: making vehicles for the pakset. 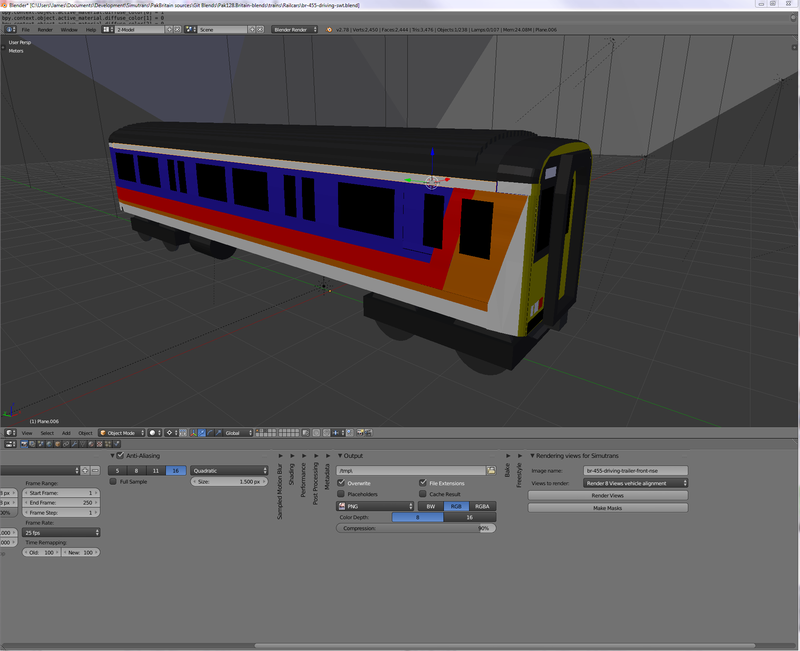 I've just made a livery for Simutrans and I've been wanting to make the livery and I cant download the addon which allows you to render liveries for Simutrans. How do I get the addon for rendering? Are you having trouble downloading it or installing it? Edit: I think I know what you mean. Which browser are you using? In Chrome you have to right-click and save as. Huge thanks for the tutorial, it is very useful! Rollmaterial - excellent work on the livery - now incorporated. Thank you for that. I am glad that the tutorial helped - do let me know if you have any questions. I just made the Classes 410 and 421. James, have you got the NSE blends for the Class 423? Now that I've got it, what do I do next? 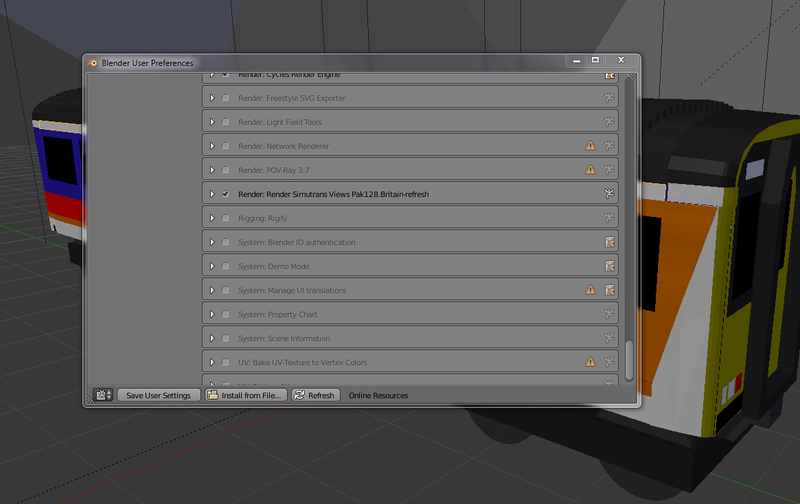 Go to the User preferences in Blender, then Add-ons, then Install from file. What do you mean by "crop and extend colours"? Colours, per se, cannot be cropped or extended - that makes no sense. 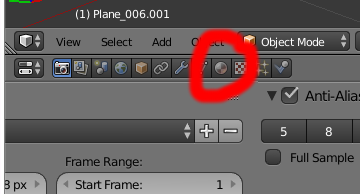 Are you referring to how to manipulate the underlying meshes (shapes) to which the colours are assigned so as to change the shapes of liveries or even the vehicles themselves? If so, the best answer to that is to read the dedicated Blender tutorial to which I put a link in the tutorial above specifically for that purpose. You will want to read the background section to get more familiar with Blender's interface, and then this section from Unit 2A to understand how to do basic editing of meshes. You might also find this and this part of the tutorial helpful, too. To learn more about materials and textures, look at Unit 2C of the tutorial, starting here. 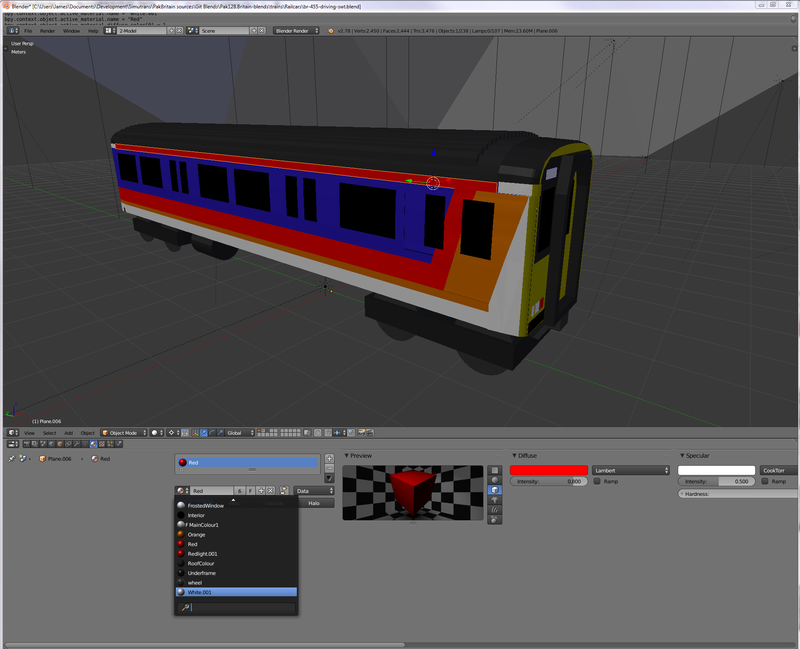 Currently, all of the liveries for trains are made with solid colours using meshes to give the liveries their shapes. 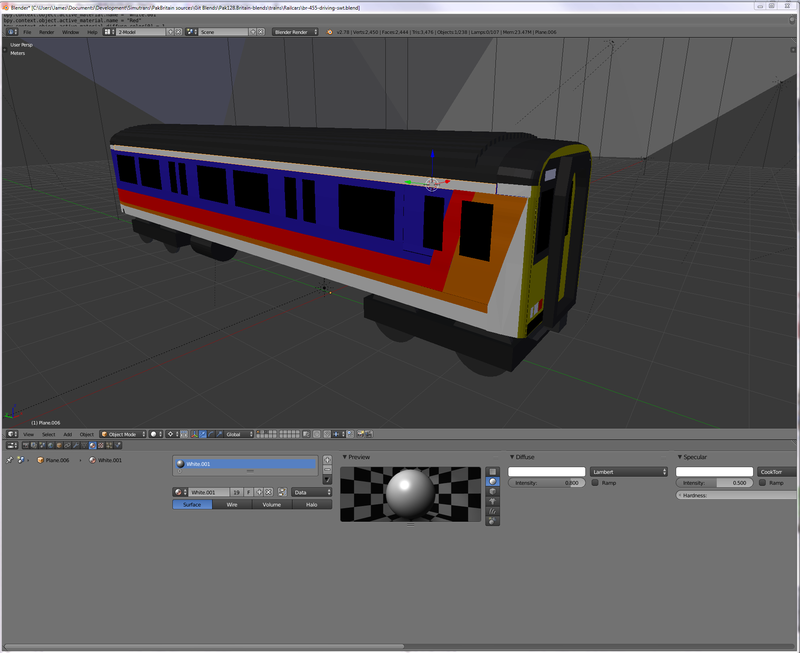 This works well for simple liveries, which were predominant before the 21st century, but in modern times, complex liveries make this technique difficult to use successfully. Aircraft in this pakset have always been made with textures for liveries, which you might find easier to do if you want to produce modern liveries, although you will not have any examples to work from unless you look at the aircraft models, which are produced differently in any event. In any event, Unit 2C does explain how to use textures. Ultimately, it is your choice as to whether to make the liveries from solid colours or to use textures, or some combination of the two (but if you do use textures, make sure that the colours are the same as in the solid coloured liveries). In that tutorial, anything beyond Unit 2C is probably more advanced than you will need for making graphics for Simutrans using the already set up templates and addons. Edit: Incidentally, would anyone be interested in a tutorial on how to add new sound effects to Simutrans? (This would be the same for Standard and Extended).